Thought I’d share my thoughts on the first Redefining Learning event to be held in Scotland at West College Scotland. It was an absolutely fantastic event and I’m already looking forward to the next one. The afternoon comprised of a few talks before splitting up into various workshops led by Microsoft Innovative Educator Experts. Andy Nagle from Microsoft discussed redefining learning and how technology is the class isn’t magic on its own however in the hands of the right teacher it can be. Ian Stuart then talked about the use of Microsoft Products in Education, before showing us some great examples of how Office Mix, Sway and OneNote can be used in the class. Next up was Marie Renton sharing her experience of using Skype in the class and in particular taking part in Mystery Skype sessions with classes from around the world. She has been using this in her school to teach French to the children in P5-7 in her school and explained how it worked and how schools can get involved. For me the best part though was as well as telling us all about the fab things she explained what difficulties she had to overcome in order to make the whole thing work and that is a lesson in itself if you are determined enough and persevere you can make these things work and her pupils certainly seem to get so much out of it. You can find more information on https://education.microsoft.com/ about Mystery Skype. Natalie Lochead shared her experience of using Skype connect with other schools to learn with them and also talked about how by using Skype in the class children can go on virtual field trips. Finally, David Renton spoke about coding in schools and the importance of coding & IT skills today as there is a skills shortage within Scotland with around 11000 jobs going unfilled. He talked about some of the tools available to teachers for teaching coding and then gave a demonstration of Kodu http://www.kodugamelab.com/ and TouchDevelop https://www.touchdevelop.com/ . Kodu is an environment that is suited best to P5-7 and lets the children create their own games within a 3d world. It’s really easy to program with simple commands that for the basis of while something is happening do something. TouchDevelop is an online tool that’s more suited for secondary pupils and it lets you create apps and games from your web browser and on any device so you can start creating on the pc and finish what you are doing on your mobile device on the way home. Having used both of these tools I would totally agree and know that the pupils always find them great fun to use and create with. After the talks we headed off to our workshops and I’m disappointed I never got to see anyone else’s. Marie & Natalie’s workshop looked at the use of Sway. 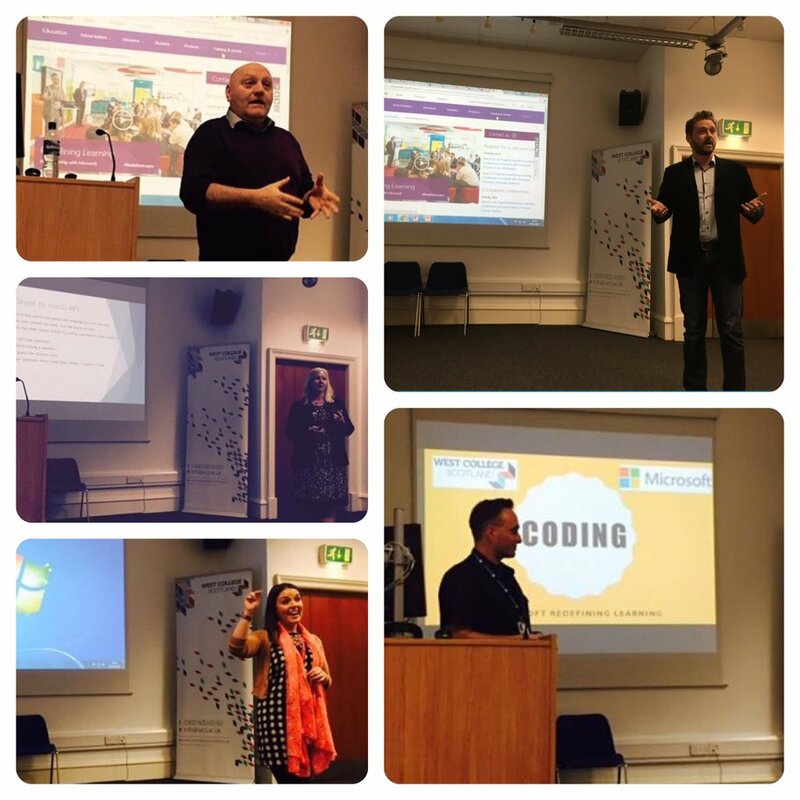 Samina Hassan’s workshop was about using Office Mix and Nicola Paterson & Ian’s session covered using OneNote. However along with Andrew Minshall I helped out at the Coding session led by David. This was a chance for the teachers to get some hands on experience using Kodu or TouchDevelop and it was really interesting to see so many teachers wanting to try it out. I hope that when they go back to school they will keep on trying. After the coding session myself and Andrew did a session on how we have used Minecraft in school. Andrew talked about how he has been using Minecraft Edu version in school and has been creating a model of the school (including teachers) with the children. As well as this the children have been using the Minecraft experiences as prompts for writing and they have even been creating spelling walls and peer marking each other’s spelling within their world. His next project is going to be creating a Scottish Landmark for the Build it Scotland project http://www.bbc.co.uk/programmes/p031dzs4 Which leads me on to the work I have been doing with my local primary school and getting them involved in taking part in Build it Scotland http://www.bbc.co.uk/programmes/p03cddly I used Minecraft too but on the Raspberry Pi which is a more limited version than the Minecraft Edu version. However when undertaking the project which lasted around 15 hours over a good few weeks over half of the lessons were spent learning about landmarks and planning out what we would do in Minecraft on paper and we also used some number cubes as well to create models in school before finally moving onto Minecraft and getting the models built in the world. 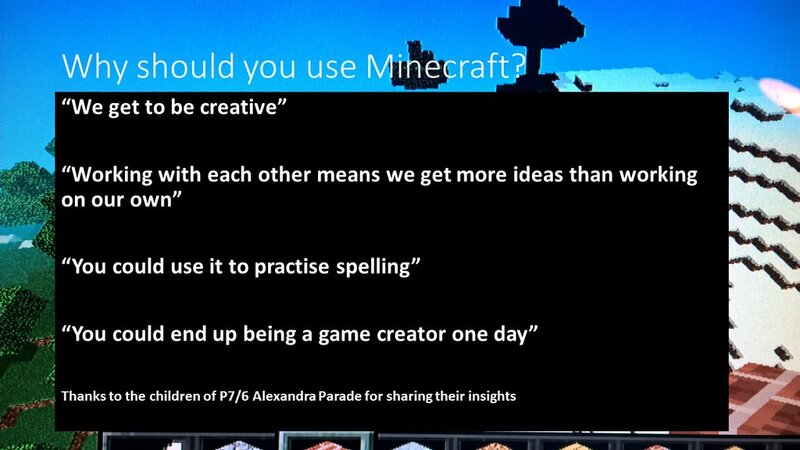 For me it was to show the teachers that while the may think Minecraft is a game there is a lot they can do to enhance children’s learning and there is a lot they can do without using Minecraft to start with. We did a lot of planning on paper first then used number cubes to visualise our models before finally getting on to Minecraft to build them. By using Minecraft as a motivational tool it encourages the children to want to work more and learn more about their topic and yes it is great fun for them when they get onto Minecraft to build their models. I left the teachers with some words from children I had spoken to before the event and they gave some advice to the teachers as to why they should use Minecraft with reasons including working together, helps us be more creative, learn new things and my favourite it it’s helped them realise and think more about computing as a career choice when they are older.